Classico capsules Caffè Bonini compatible with Nespresso®. Compatible Caffè Bonini capsules are made with the best coffee beans and roasted in Italy. 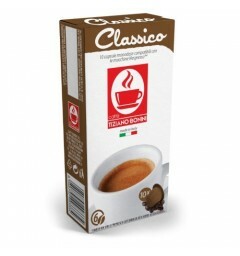 Classico is the softest blend among all Caffè Bonini mixtures revealing a delicately fruity taste. Caffè Bonini Ristretto capsules, Nespresso® compatible. Caffè Bonini creates Nespresso® compatible capsules with the best assemblages of Italian coffees. The coffee beans are slowly roasted et gives it a rich taste and a long finish. Caffè Bonini Forté capsules. Compatible with Nespresso®. Caffè Bonini creates Nespresso® compatible capsules with the best assemblages of Italian coffees. Amateurs of high intensity coffees will be delighted to discover the Forté blend. Caffè Bonini Seta capsules, Nespresso® compatible. Italian coffee capsules compatible with Nespresso® coffee machines. Find flavours of coca beans and almonds in this Seta coffee 100% arabica. This coffee is soft and delicate. Caffè Bonini Eccelso capsules, Nespresso® compatible. Italian coffee by Caffè Bonini. The pods are compatible with Nespresso® coffee machines. This coffee is elegant and of a high intensity thanks to its strong robusta. Nespresso ® Compatible Capsules from Vanilla Coffee of the brand I Capricci. This blend uniquely combines the opposites that are: coffee with all its atypical characteristics and the sweetness of vanilla. Chocolate flavoured Caffè Bonini, Nespresso® compatible pods. Italian coffee capsules compatible with Nespresso coffee machines. 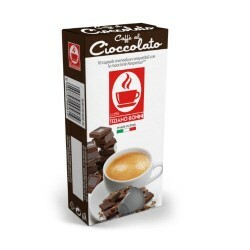 Cioccolato is a perfect assemblage of Italian coffee and chocolaty flavours.